This recipe is one of those I tried more than 7 – 8 times to get a perfect taste. Have you tried Breadsticks from Dominos? 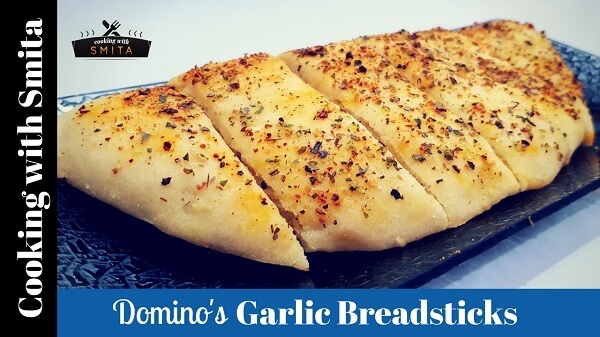 Here I’m sharing a perfect recipe to make Domino’s Garlic Bread Sticks at home. 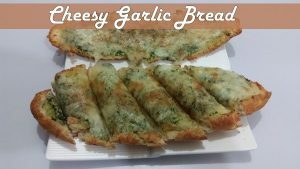 This recipe is a basic version of garlic Breadsticks which requires All Purpose Flour, Yeast and a secret mixture of Oregano seasoning mix as basic ingredients. Dissolve Sugar in warm water and add Dry Yeast, mix well and set aside for 10 minutes till the yeast is activated. Take a large bowl, add All Purpose Flour, freshly grated garlic & Salt. Add activated yeast and prepare the dough. There’s no need to add extra water into the dough, though if required, you can add 1 – 2 tbsp. Finally, add 1 tbsp. Olive Oil, mix well. Cover the dough and set aside for 30 – 35 minutes. Add some dry flour and knead the dough until smooth. Divide the dough into two equal portions and roll one part into a thick circle. Fold it over and gently seal the edges. Grease baking tray with butter and sprinkle a mixture of Oregano, Chilli Flakes and Garlic powder. Place the garlic bread on a baking tray, brush the top with butter and sprinkle some Oregano mixture. Use a knife or pizza cutter to cut into sticks. Bake at 180 degree Celsius for 10 minutes and then at 220 degrees for 5 – 7 minutes. Remove from oven and serve Domino’s Garlic Bread Sticks with Mayonnaise, Cheese Sauce or Tomato Sauce.